Mountain View ARES/RACES provides opportunities for licensed ham radio operators to increase their skills and knowledge in communication networks and in emergency preparedness. There are several types of opportunities to gain experience in network communicaitons, outlined below. SPECS Net - Mountain View ARES/RACES meets every Monday night at 2000 hours on the W6ASH repeaters (-145.270 & -224.14, both with 100 Hz PL) and on 440.800, for the Southern Peninsula Emergency Communications System (SPECS) net. Subsequently, when prompted, participants go to the Mountain View simplex channel, 146.535, to check-in with Mountain View ARES/RACES and hear local announcements (QSTs). Local Monday Night Net Control Operators at 8:00 P.M.- In connection with the SPECS Net above, participants can act as control operator during the check in process, gaining valuable experience in net control. New participants will receive training and with the script and check-in roster. Sign-up online at www.scc-ares-races.org/net-res.html or send email to Phil Henderson, KF6ZSQ, telephone 650-961-6802. The script for Mountain View specs net and the current roster of participants can be found under "Links/Resources". NTS Traffic Net - TUESDAYS and THURSDAYS at 9:00 P.M. - The ARRL Santa Clara Valley Section has a Traffic Net at 2100 hours Tuesdays and Thursdays on: -146.640 (162.2 PL). Thanks to the Loma Pioneer Repeater Club for hosting. This net is part of the National Traffic System (NTS). We are in need of more traffic handlers, especially packet folks. Training gladly given. The American Radio Relay League (ARRL) began in 1915 with NTS as the formal traffic handling system. It remains the standard today for emergency traffic handling throughout the US. For more information please visit our SCV NTS Yahoo group or contact Andreas, K6OTT, Official Relay Station & Sunnyvale AEC. Practice Drills - During the year field exercises and drills are carried out to sharpen our communications skills and identify areas for improvement. Under the navigation button for "Calendar" on this website, you will see the extent of these opportunities. Some of them are specifically for the ARES/RACES network of ham operators and others involve ARES/RACES and CERT (Community Emergency Response Teams). Drills are held on both the county and city level. In addition, there are opportunities during the year to participate in activities that employ ham radio communications in other cities. 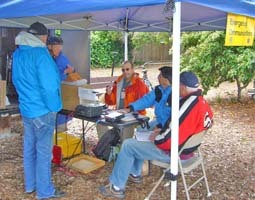 In the picture to the left, Rudy Bahr (W6OWI), Bob Fishman (K6FSH), and Hugo Penafiel (KI6VNJ) join other hams at a communication station in Cuesta Park on May 15, 2011 during a city-wide CERT drill. Debriefing at 1000 Villa Street after CERT drill on April 21, 2012. Classroom training is offered to expand knowledge and skills in radio communications and preparedness. Each month a training session of 1-1/2 to 4 hours is offered in Mountain View and is usually led by our Emergency Coordinator or an assistant EC. Recent topics have included Disaster Service Workers Activation, Principles of Amateur Radio Net Control, and High Frequency Operations. Some of the recent training presentations are available on the site under Links and Resources. 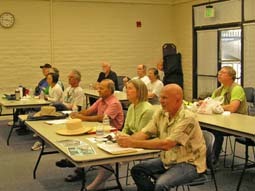 Classes available in the area are listed on the Santa Clara County ARES/RACES website.